Solidify your understanding of the most common diseases you’ll encounter as a veterinary technician! 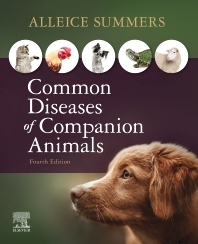 Common Diseases of Companion Animals, 4th Edition is an easy-to-use reference that’s divided into sections by species, with chapters in each section organized by body system. Each disease is presented in monograph form, with clinical signs, diagnostic laboratory work-up, treatment options, and client information to ensure the information you need is always available. New to this edition is coverage of backyard chickens and potbellied pigs This succinct text provides invaluable coverage for veterinary technology students and also serves as a handy reference for working practitioners. Coverage of the common diseases veterinary technicians are likely to encounter in practice keeps students up-to-date with the diseases and disorders they are most likely to assist in diagnosing and managing. Diseases organized by body system enables students to quickly refer to the most accurate information. Consistent, monograph format includes a description, clinical signs, laboratory work-up, treatment, medications, after care, client information, and prevention for each disease. Clearly defined role of technician helps students understand what is expected of them as a working professional. Introductory chapter on pathophysiology provides information on the foundations of disease and the body’s response to disease before proceeding to the specific diseases of each system. Full-color design and illustration program reinforces what diseases look like — such as signs exhibited in the animal, in lab specimens, and in surgical corrections — and demonstrates techniques, such as urethral catheter placement in a female cat. Nursing care sections include descriptions of changes in clinical signs with improvement or decline that will affect treatment, as well as more Tech Alerts to highlight the veterinary technician’s responsibilities. A variety of review questions, including open-ended critical thinking questions. Vet Tech Threads direct learning by outlining key terms, learning objectives, and the glossary.